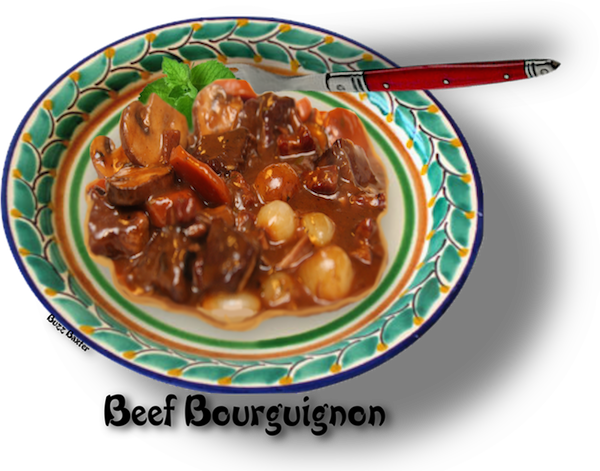 BEEF BOURGUIGNON - FRENCH OF COURSE, BUT OFTEN CONFUSED WITH IRISH STEW, BEEF STEW AND OTHER STEWS WITH BEEF. Like many dishes, beef bourguignon has its purists. The purists believe that there should be no potatoes and most others belive that potatoes, carrots, celery, peas and onions are the way it should be made. Here you will find two recipes, one with potatoes and one without. Neither are just a beef stew, but a much refined version of what most of us grew up with. This is no browned beef in a pot of water with some vegetables. beef bourguignon uses wine, lots of wine. It also uses brandy, sherry and mushrooms, lots of mushrooms. There is beef stock used, but with the purist's version, the beef stock is optional. Either way, when brought to the table you can immediately tell this isn't any ordinary stew. •  4 celery stalks cut into 1 inch pieces on the diagonal. •  6 white new potatoes, peeled and quartered. theDutch oven with the bacon drippings. sauté 1 minute. Transfer vegetables to bowl with beef. until beef is tender, about 1 hour 30 minutes. after heat has been turned off. prepared 1 day ahead. Cover and chill.) Rewarm over low heat before serving. beef tenderloin)  I believe the chuck roast or 7 bone roast has more beef flavor. tablespoons oil until browned on the outside and very rare inside, about 2 to 3 minutes on each side. Remove the beef from the pan and set aside on a platter. garlic and cook for 30 seconds. and cook uncovered on medium-high heat for 10 minutes. Strain the sauce and return it to the pan. 4. With a fork mash 2 tablespoons butter and the flour into a paste and whisk it gently into the sauce. Simmer for 2 minutes to thicken. 10 minutes, until browned and tender. reheat gently for 5 to 10 minutes. Do not overcook. Season, to taste, and serve immediately. NOTE: ALTHOUGH NOT THE EXACT RECIPES SHOWN ABOVE,  THE VIDEO BELOW MIGHT BE OF HELP TO "DO IT YOUR WAY".